Healthcare: Why do we need medical policies? In my last blog post, I discussed how US health insurance companies decide what to pay for, what information they need to make decisions on paying for care, and some of the ways they go about making those decisions. I only briefly discussed why medical policies are required and why there’s a lot of complexity around health care. I hope to shed some light on this and help people understand the difficulty that both Providers and Insurers have in dealing with the cost of health care. First, not all diseases are equal. This one is pretty obvious, but I’m not even talking about how severe the diseases. That’s vitally important of course, but even a “minor” disease can lead to long term impacts to quality of life because we don’t know how to treat the disease. In some of these cases it might just be embarrassing, such as if I eat Gluten and I’m out and about the next day. I’ll probably have some serious issues and won’t be able to enjoy myself while I’m out. There are two reasons for that. One, it’s not really obvious what condition I have. Two, there’s no treatment to allow me to eat gluten other than “avoid” wheat, barley, and gluten. Which in many cases is rather difficult. This brings me to the second reason why there’s a lot of difficulty – it’s difficult to even diagnose what disease people have. So, for gluten issues you have only a few options, one is a blood test to looking for an immune response to a gluten or to have a colonoscopy to see what sort of damage has been done to your large intestines. Because of this lack of precision, in many cases it can lead to the matching the wrong treatment for the right disease, vice versa, or wrong treatment for the wrong disease in the most extreme cases. 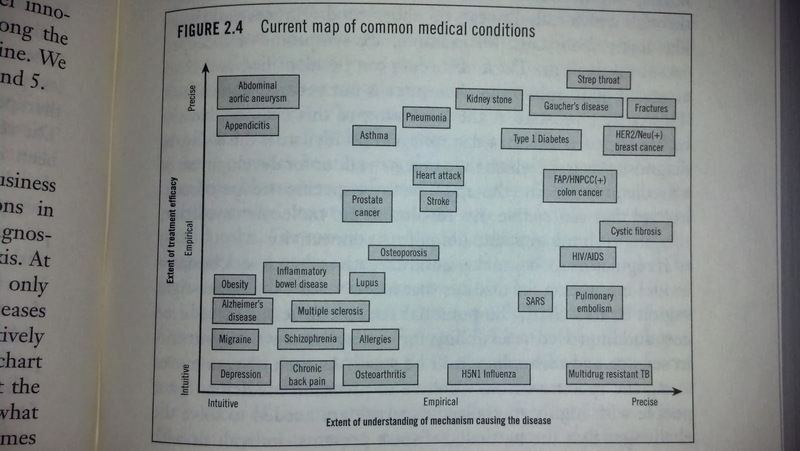 In the above picture from “The Innovator’s Prescription” it’s clear which diseases are “better” to have, those in the upper right. While those in the lower left are much harder to treat and have less consistent outcomes. For anything in between the cost and quality of care is really dependent on the experiences of your provider. I believe that this is where insurance companies can add a lot of value. Using medical policies and partnering with providers they can artificially expand the experience of a provider through providing the latest scientific research and results for a treatment and disease interaction. This will help allow providers to focus on care while getting the latest medical news from their network of insurers. This really puts the model on it’s head as the provider can take advantage of the diverse networks they are part of to learn different components of research based on the focus of those providers. I think that a true partnership between insurers and providers really will drive down health costs. This complexity is unfortunate, but is truly part of our human condition. One way to reduce costs is to increase the amount of research that pushes care into the upper right from the bottom left. Otherwise, it’s difficult for an insurer to determine which providers are taking advantage of patients and which ones are honest. There’s imperfect information on both sides and the patients pay for it in the long run. This entry was posted in Economics, Healthcare and tagged doctor, health, health insurance, Healthcare, MDs, Mental Health, providers. Bookmark the permalink. Good work Ryan, bringing what we know to the research of what we need to know. The loop.